SMi introduces its 15th Annual Nordic Card Market Conference. The Nordic Card Payments industry is an area which is currently undergoing major change. There are new regulatory demands coming from the EU, which is impacting the banks business revenue models in payments meaning banks need to be more creative to ensure their services are still economically viable. The importance of a good strategy has also never been more important as there has also been a large increase in new market players competing with the traditional banks. Finally, Fintech is an increasingly important area for Nordic Banks to keep pace with, as new technologies including wallets, E-Signature and mobile payments are becoming available effectively increasing competition. Questions that arise from this such as customer retention and keeping the banks place in the market will be discussed in depth at this well established conference. • What are the impacts of real time payment solutions on the card market? • How can banks deal with the impact on the banking infrastructure? • Commercialising the process: How can this fit into the banking business model? • How will we pay in the future? • Are the new regulations, technology and rapidly changing payments landscape a threat or an opportunity to banks? • The big question: Are new entrants really a threat or can they be ignored? How will digitalisation affect the playing field in retail payment markets? Jukka Salonen is the Head of Nordea Group Simplification reporting to Group CEO. Group Simplification is to transform Nordea to meet the future needs of the customers and the market. The rapid change in customers’ preferences towards using online and mobile solutions, as well as the increasing operational regulation, are the main drivers for Simplification. Group Simplification is providing the direction to build the future Relationsip Bank responding to drivers and enabling Nordea to develop even more personalised and convenient services to the customers. Prior to taking up the role of building the foundation for the future Nordea Jukka Salonen worked as CEO for Nordea Finance, 2007-2014. He led the finance companies through a transformation from local to common in terms of culture, business, operating model and platforms. During that time Nordea Finance grew from position 18 to position 7 in Europe in terms of new business and total assets (Leaseurope ranking). A great recognition for Nordea Finance was to win the Innovator of the Year award 2010 and Vendor Finance Provider of the Year 2013. Jukka Salonen contributed actively to developing the European leasing market as chairman for Leaseurope 2010-2012 and 2013-2014. He won the Industry Ambassador of year 2013 Award by Leasing Life and was also awarded in 2014 by Lifetime Award by Leasing Life. Jukka Salonen joined the Finance company in 1999 with a strong background retail and corporate banking in Merita and Merita-Nordbanken. He also has experience in the business development from the board of directors’ perspective being member or chairman of the board in several companies. • What are future banking models? 15:20 PANEL SESSION: Who will be the winners and the losers in the fintech world? • With so many players; who are the ones to watch? • What do telecom companies offer to consumers that banks don’t? • What will be the deciding factors? Peter has an extensive experience working in IT Management in Danske Bank, the largest Danish bank, with experience in online banking, transaction banking, cash management, consultancy, business intelligence and cards. He has a firm focus on enabling the organization and the IT architecture, to be able to deliver new solutions aligned with business and customer demand. Peter is Development Director and Head of Card Systems in Group IT at Danske Bank, and is responsible for the development of credit/debit card-solutions and ATM's. Danske Bank is on the forefront of cards development with a wide range of solutions, such as contact-less cards, prepaid cards and combo cards. Furthermore, the payments landscape is continuously evolving, as the modern customer demands more flexible and mobile services. As an example the market-leading mobile-wallet in Denmark, MobilePay by Danske Bank with 2,2 mio users, runs on the card infrastructure. • What makes a superior customer experience? • How can Nordic banks navigate the new world? • Using regulatory changes to your advantage. 9:50 Protecting the Bank’s interests in an interchange fee free world. • Preparing for non-card NFP payments? • What will the essential requirements for a financial institution’s infrastructure be in the future? • How can this be achieved in a cost-effective way? • In a rapidly changing market: how can adaptability be ensured? • Bitcoin and cryptocurrencies: Is there any substance behind the hype? Francisco joined the European Monetary Institute, the forerunner of the European Central Bank, in May 1995. Francisco participated in the development of the TARGET system (the Real Time Gross Settlement system for the euro). Since June 2005 he has been working in the Market Integration Division in the Directorate General Market Infrastructure and Payments of the European Central Bank. With almost 20 years of experience in Market Infrastructures, as Deputy Head of Division, Francisco conducts policy work aiming for further harmonisation and integration of payments at European and global level, including clearing and settlement. Francisco holds a master’s degree in computer science from Universidad Autonoma de Barcelona (Spain)." View details European Sting Official Media Partner http://www.europeansting.com The European Sting is the new online, Brussels based, European media that was born to bring a different critical and truly independent angle to European News and Affairs. The Sting is giving every day the fierce fight for a better and stronger European Union through constructive criticism and unique insights. We are treating daily in a unique way European Politics, Economics, Foreign Affairs, Business and ICT Agenda. We are committed to bridge the gap between Brussels and the EU member states by freely voicing the views of every European citizen. Tired of reading the basics? Visit http://www.europeansting.com and be part of the Hive that disrupts European Media. View details Acuity Market Intelligence Supporters http://www.acuity-mi.com Acuity Market Intelligence is the definitive source for biometrics market intelligence with a proven record of accurately anticipating biometric and identity market trends. Acuity consistently delivers original, thought provoking, and reliable industry insight. Acuity offers strategic consulting services and a wealth of market data and analysis via www.acuity-mi.com, the "Biometrics UnPlugged" LInkedIn group, and twitter #cmaxmost. View details Bandwidth Recruitment Supporters http://www.bandwidthrecruitment.com/ Bandwidth Recruitment is an independent provider of permanent, contract and interim staff specialising in the cards & payments sector. We have spent years working within the payments sector to build an enviable network of contacts which, combined with a thorough understanding of the payments lifecycle, enables us to understand our clients' requirements in detail and accurately match the most appropriate candidates. View details Banking Automation Bulletin Supporters http://www.rbrlondon.com/bulletin Banking Automation Bulletin is an international subscription newsletter focused on key issues in self-service banking, branch automation, cards and payments. The Bulletin is published by London-based research and consulting firm RBR, and draws extensively on the firm’s authoritative industry research and analysis. The Bulletin is valued by senior executives in over 100 countries worldwide for providing independent and insightful, news, opinions and information on issues of core interest. View details BayPay Supporters http://www.baypayforum.com/ The BayPay Forum, a Silicon Valley-based international network composed of over 11,000 payment and commerce executives, entrepreneurs and investors from thousands of different companies, serves as a forum to connect members in identifying and understanding the emerging trends and innovations in the industry. View details CardMag Supporters http://www.cardmag.sk Cardmag is a czech & slovak independent magazine in sphere of payment cards. Quaterly it comes up with information about marketing, technologies, NFC, Contactless, security, legislation, profile of countries, statistics from home and abroad and also about project SEPA. Cardmag brings out comments, glossary and analyses related to payment cards. Furthermore, you can find there original reports right from domestic market, profiles of regions, companies and personalities from the world of payment cards. View details Electronic Finance Supporters http://www.inderscience.com/jhome.php?jcode=ijef IJEF publishes articles that present current practice and research in the area of e-finance. It is dedicated to design, development, management, implementation, technology, and application issues in e-finance. View details Euromonitor International Supporters http://www.euromonitor.com/consumer-finance Euromonitor International is the world leader in strategy research for consumer markets. As an independent company, it offers unmatched detail and unbiased content for every region, country, category and channel. From socio-economic context to intimate detail on the smallest products or markets, Euromonitor International provides market research focused on your organisation’s needs. Euromonitor International is headquartered in London, with regional offices in Chicago, Singapore, Shanghai, Vilnius, Santiago, Dubai, Cape Town, Tokyo, Sydney, Bangalore and São Paulo. The company has a network of over 900 analysts worldwide. Its extensive network of strategic analysts in 80 countries provides the depth of global, national and local business information required in today’s increasingly international business environment. View details European Payment Institutions Federation Supporters http://www.paymentinstitutions.eu/ The European Payment Institutions Federation (EPIF), founded in 2011, represents the interests of the non-bank payment sector at the European level. We currently have over 250 authorised Payment Institutions (PI) and other non-bank payment providers as our members offering services in every part of Europe. EPIF thus represents roughly one third of all authorized Payment Institutions in Europe. Our diverse membership includes the broad range of business models including: 3-party Card Network Schemes, Acquirers, Money Transfer Operators, FX Payment Providers, Mobile Payments, Payment Processing Service Providers, Card Issuers, Third Party Providers, Digital Wallets. We play a constructive role in increasing payment product diversification and innovation tailored to the needs of payment users (e.g. via mobile and internet).It is our desire to promote a single EU payments market via the removal of excessive regulatory obstacles. View details European Payments Council Supporters http://http://www.europeanpaymentscouncil.eu/ The European Payments Council (EPC), representing payment service providers, supports and promotes European payments integration and development, notably the Single Euro Payments Area (SEPA). The EPC is committed to contribute to safe, reliable, efficient, convenient, economically balanced and sustainable payments, which meet the needs of payment service users and support the goals of competitiveness and innovation in an integrated European economy. It pursues this purpose through the development and management of pan-European payment schemes and the formulation of positions and proposals on European payment issues in constant dialogue with other stakeholders and regulators at the European level and taking a strategic and holistic perspective. The primary task of the EPC is to manage the SEPA Credit Transfer and SEPA Direct Debit Schemes in close dialogue with all stakeholders. The EPC is an international not-for-profit association which makes all of its deliverables available to download free of charge on the EPC Website. For further information please contact secretariat@epc-cep.eu or visit www.epc-cep.eu. View details Financial Innovation in Banking Supporters http://www.inderscience.com/jhome.php?jcode=ijfib IJFIB provides a scientific publication outlet for the topic of financial innovation in the economics of banking. It focuses on financial innovation in terms of bank products and services, and bank production processes and organisational forms. This perspective acknowledges the complexity and importance of innovation in the financial intermediation industry. IJFIB aims to foster discussion and research on this fast-growing topic. View details Financial IT Supporters http://www.financialit.net/ Financial IT is a cutting edge financial technology magazine. We cover the latest trends and issues in payments & cash management, securities services and trade & supply chain finance, as well as the technology/business solutions and market infrastructures that underpin those businesses. View details Investing.com Supporters http://uk.investing.com/ Investing.com is a global financial portal and internet brand composed of 27 editions in 21 languages and mobile apps for Android and iOS that provide news, analysis, streaming quotes and charts, technical data and financial tools about the global financial markets. Each edition covers a broad variety of local and global financial vehicles including Stocks, Bonds, Commodities, Currencies, Interest Rates, Futures and Options. Founded in 2007, Investing.com has a growing readership worldwide and is now a leading global financial portal committed to constantly launching innovative features and sections to ensure an optimal one-stop source for its readers. View details Juniper Research Supporters http://www.juniperresearch.com Juniper Research specialises in the identification and appraisal of high growth opportunities across the mobile telecoms, content, and applications sectors. We offer market intelligence, analysis and research in the form of analyst reports, subscription databases and consultancy services. Juniper investigates the markets such as mobile payments, banking and financial services as well as NFC, ticketing and coupons amongst others. View details Mobile Payments World Supporters http://www.mobilepaymentsworld.com/ Mobile Payments World is a digital newsletter, published 22 times a year, monitoring developments in M- Payments, M- Commerce, NFC and Mobile Money Transfer, Contactless Payments, M-POS globally. We also offer Research, Consultancy, Marketing and Video services to help evolve your product or business in the payments market. View details NFC Times Supporters http://nfctimes.com/ NFC Times, the premier publication covering Near Field Communication and contactless technology, features 100% original content: exclusive stories, facts, news and analysis. Other publications rely on press releases and talking points; NFC Times provides the independent, in-depth coverage of global NFC and contactless issues you need to stay competitive. View details Payments Cards & Mobile Supporters http://www.paymentscardsandmobile.com Payments Cards & Mobile has twenty years experience reporting on card payments, POS Terminals, Issuing and Acquiring and Risk & Compliance plus the cutting edge technology of M-Payments, Contactless Payments, M-POS and M-Commerce. It is published six times a year, with supplements, and has worldwide distribution. View details Smart Insights Supporters http://www.smartinsights.net Smart Insights Weekly is a newsletter covering the smart card industry, its businesses, its technologies, its markets as well as its technology suppliers. Smart Insights covers all the major trends in the industry, it encompasses worldwide business, standardization bodies. Smart Insights Reports are research reports providing key facts and figures as well as strategic insights about a technology, an area or a major issue in the secure transaction industry. Smart Insights Reports bring business modeling, forecasting and competitive analysis. View details Smartex Supporters http://www.smartex.com/ Smartex was established in 1993, and since then has developed the world’s leading group of membership-based associations for organisations working in the smart technology sector. Smartex brings together the community of suppliers, users and potential users, to share knowledge and increase awareness of each sector’s successes, issues and potential direction and pace. As a member of Smartex, you and your company will be part of this community, and will have the opportunity to meet industry peers and – if you are a service provider – prospective customers, regularly and informally. 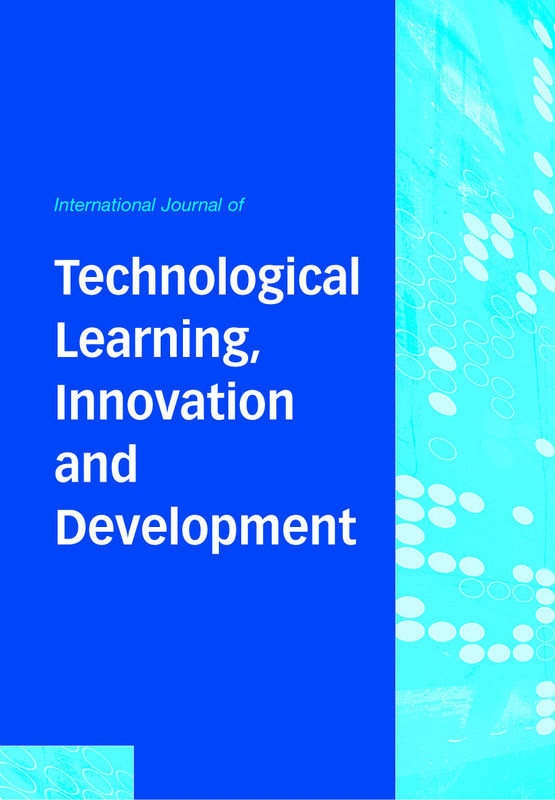 View details Technological Learning, Innovation and Development Supporters http://www.inderscience.com/jhome.php?jcode=ijtlid IJTLID is devoted to the study of the nature of technological innovation processes at the level of firms, industries/clusters and countries, the various influences on such processes, and their implications for industrial growth, techno-economic and social development in the context of contemporary late-industrialising countries. Its broad approach will help uncover the dynamics and intricacies of the processes of accumulation and sustainability of innovative capabilities in developing countries, and these themes will be explored within a broad spectrum of economic activities. View details The Paypers Supporters http://www.thepaypers.com The Paypers (www.thepaypers.com) is the Netherlands-based leading independent source of news and intelligence for professionals in the global payment community. Our products are aimed at merchants, payment services providers, processors, financial institutions, start-ups, technology vendors and payment professionals and have a special focus on all major trends and developments in payments-related industries including online and mobile payments, online/mobile banking, cards, cross-border ecommerce, e-invoicing and SEPA. We are also keen on keeping our readership informed with regard to online fraud prevention innovations and the most significant trends in the digital identity space. 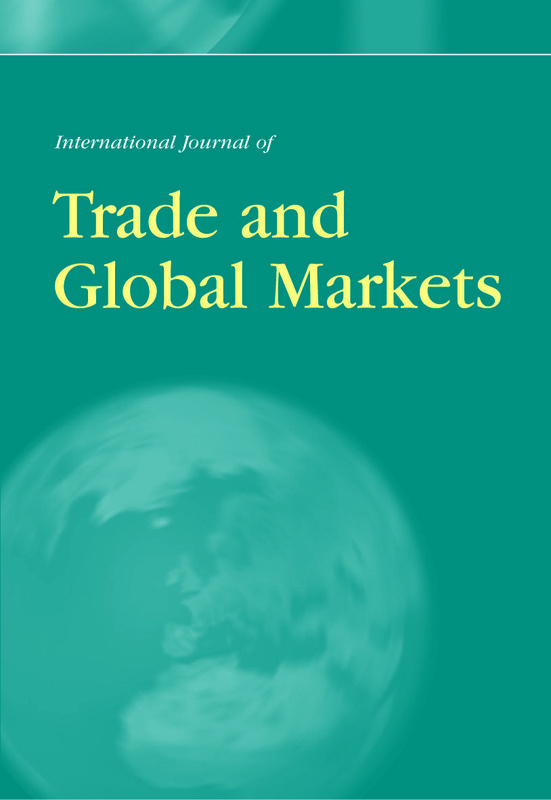 View details Trade and Global Markets Supporters http://www.inderscience.com/jhome.php?jcode=ijtgm IJTGM fosters discussion on the various interrelationships between economic growth at national and international levels and international trade. The journal will emphasise the implications that trade policy exerts on economic growth and vice versa, as well the role of national governments, international organisations and the business community on related issues of worldwide concern. 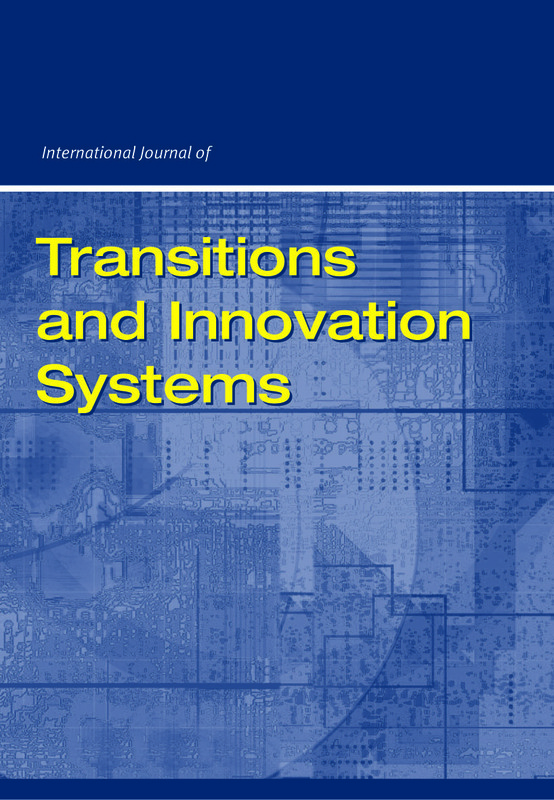 View details Transitions and Innovation Systems Supporters http://www.inderscience.com/jhome.php?jcode=ijtis IJTIS addresses the transition role of innovation systems for the community, highlighting the implications that policy choices have on both the welfare of humans through technology and on the catch-up process in transition countries. The concept of 'systems of innovation' provides a new approach to the growth of countries, competitiveness of nations and future role of innovation and interaction between universities, government and enterprises through the 'Triple Helix' system, a systems approach for countries en route to a market economy. View details Treasury Management International (TMI) Supporters http://www.treasury-management.com Treasury Management International (TMI) is a well respected and independent voice in the treasury world, renowned globally for its sharp editorial focus and breadth of opinion. With real-life experiences from practitioners, TMI showcases topical, pragmatic solutions and strategic insights providing valuable material for all practitioners, from experienced treasurers and CFOs to those new to the profession. Radisson Blu creates iconic buildings with individual interiors invoking an inviting, exciting ambiance and offering a holistic hospitality experience that is totally relevant to now. Radisson Blu flagship properties can be found in prime locations, including major cities, airport gateways and leisure destinations around the world. Radisson Blu Hotels & Resorts, part of the Rezidor Hotel Group, currently operates more than 230 hotels worldwide, with another 51 projects under development. Radisson Blu is a first class full service hotel brand with key differentiators such as the 100% Guest Satisfaction Guarantee and the Yes I Can! spirit of service. Carlson, a privately held, global hospitality and travel company, based in Minneapolis (USA), is the majority shareholder of The Rezidor Hotel Group. Together, Carlson and Rezidor have hotels in more than 90 different countries, 1,070 hotels in operation and 240 hotels under development. Bandwidth Recruitment is an independent provider of permanent, contract and interim staff specialising in the cards & payments sector. We have spent years working within the payments sector to build an enviable network of contacts which, combined with a thorough understanding of the payments lifecycle, enables us to understand our clients' requirements in detail and accurately match the most appropriate candidates. 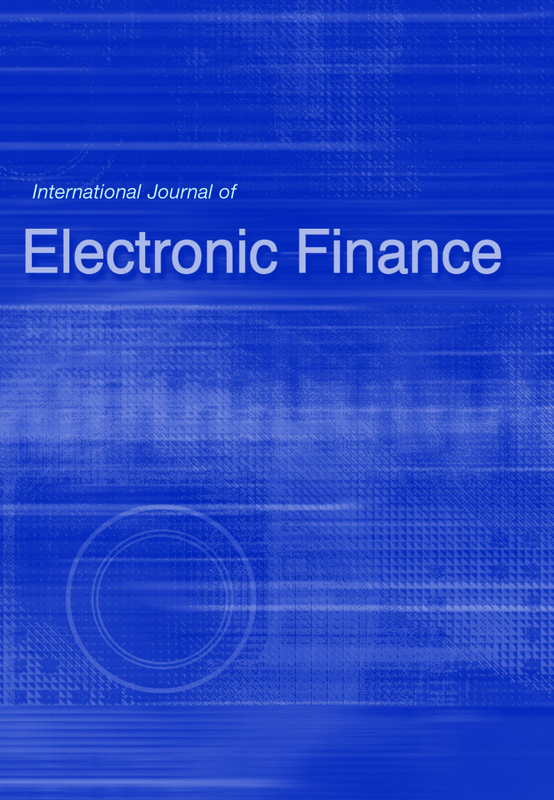 IJEF publishes articles that present current practice and research in the area of e-finance. It is dedicated to design, development, management, implementation, technology, and application issues in e-finance. Acuity Market Intelligence is the definitive source for biometrics market intelligence with a proven record of accurately anticipating biometric and identity market trends. Acuity consistently delivers original, thought provoking, and reliable industry insight. Acuity offers strategic consulting services and a wealth of market data and analysis via www.acuity-mi.com, the "Biometrics UnPlugged" LInkedIn group, and twitter #cmaxmost. 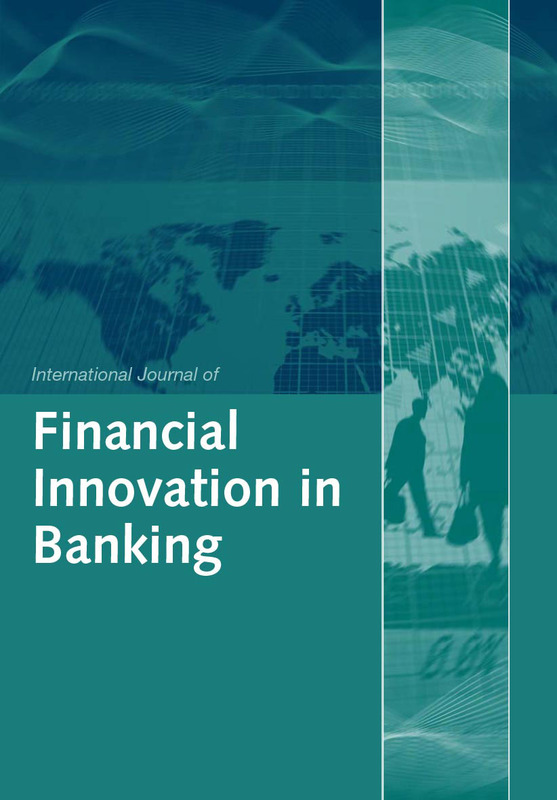 IJFIB provides a scientific publication outlet for the topic of financial innovation in the economics of banking. It focuses on financial innovation in terms of bank products and services, and bank production processes and organisational forms. This perspective acknowledges the complexity and importance of innovation in the financial intermediation industry. IJFIB aims to foster discussion and research on this fast-growing topic. Financial IT is a cutting edge financial technology magazine. We cover the latest trends and issues in payments & cash management, securities services and trade & supply chain finance, as well as the technology/business solutions and market infrastructures that underpin those businesses. Mobile Payments World is a digital newsletter, published 22 times a year, monitoring developments in M- Payments, M- Commerce, NFC and Mobile Money Transfer, Contactless Payments, M-POS globally. We also offer Research, Consultancy, Marketing and Video services to help evolve your product or business in the payments market. The Paypers (www.thepaypers.com) is the Netherlands-based leading independent source of news and intelligence for professionals in the global payment community. Our products are aimed at merchants, payment services providers, processors, financial institutions, start-ups, technology vendors and payment professionals and have a special focus on all major trends and developments in payments-related industries including online and mobile payments, online/mobile banking, cards, cross-border ecommerce, e-invoicing and SEPA. We are also keen on keeping our readership informed with regard to online fraud prevention innovations and the most significant trends in the digital identity space. Investing.com is a global financial portal and internet brand composed of 27 editions in 21 languages and mobile apps for Android and iOS that provide news, analysis, streaming quotes and charts, technical data and financial tools about the global financial markets. Each edition covers a broad variety of local and global financial vehicles including Stocks, Bonds, Commodities, Currencies, Interest Rates, Futures and Options. Founded in 2007, Investing.com has a growing readership worldwide and is now a leading global financial portal committed to constantly launching innovative features and sections to ensure an optimal one-stop source for its readers. Euromonitor International is the world leader in strategy research for consumer markets. As an independent company, it offers unmatched detail and unbiased content for every region, country, category and channel. From socio-economic context to intimate detail on the smallest products or markets, Euromonitor International provides market research focused on your organisation’s needs. Euromonitor International is headquartered in London, with regional offices in Chicago, Singapore, Shanghai, Vilnius, Santiago, Dubai, Cape Town, Tokyo, Sydney, Bangalore and São Paulo. The company has a network of over 900 analysts worldwide. Its extensive network of strategic analysts in 80 countries provides the depth of global, national and local business information required in today’s increasingly international business environment. Treasury Management International (TMI) is a well respected and independent voice in the treasury world, renowned globally for its sharp editorial focus and breadth of opinion. With real-life experiences from practitioners, TMI showcases topical, pragmatic solutions and strategic insights providing valuable material for all practitioners, from experienced treasurers and CFOs to those new to the profession. The European Payment Institutions Federation (EPIF), founded in 2011, represents the interests of the non-bank payment sector at the European level. We currently have over 250 authorised Payment Institutions (PI) and other non-bank payment providers as our members offering services in every part of Europe. EPIF thus represents roughly one third of all authorized Payment Institutions in Europe. Our diverse membership includes the broad range of business models including: 3-party Card Network Schemes, Acquirers, Money Transfer Operators, FX Payment Providers, Mobile Payments, Payment Processing Service Providers, Card Issuers, Third Party Providers, Digital Wallets. We play a constructive role in increasing payment product diversification and innovation tailored to the needs of payment users (e.g. via mobile and internet).It is our desire to promote a single EU payments market via the removal of excessive regulatory obstacles. Smartex was established in 1993, and since then has developed the world’s leading group of membership-based associations for organisations working in the smart technology sector. Smartex brings together the community of suppliers, users and potential users, to share knowledge and increase awareness of each sector’s successes, issues and potential direction and pace. As a member of Smartex, you and your company will be part of this community, and will have the opportunity to meet industry peers and – if you are a service provider – prospective customers, regularly and informally. Juniper Research specialises in the identification and appraisal of high growth opportunities across the mobile telecoms, content, and applications sectors. We offer market intelligence, analysis and research in the form of analyst reports, subscription databases and consultancy services. Juniper investigates the markets such as mobile payments, banking and financial services as well as NFC, ticketing and coupons amongst others. Smart Insights Weekly is a newsletter covering the smart card industry, its businesses, its technologies, its markets as well as its technology suppliers. Smart Insights covers all the major trends in the industry, it encompasses worldwide business, standardization bodies. Smart Insights Reports are research reports providing key facts and figures as well as strategic insights about a technology, an area or a major issue in the secure transaction industry. Smart Insights Reports bring business modeling, forecasting and competitive analysis. Cardmag is a czech & slovak independent magazine in sphere of payment cards. Quaterly it comes up with information about marketing, technologies, NFC, Contactless, security, legislation, profile of countries, statistics from home and abroad and also about project SEPA. Cardmag brings out comments, glossary and analyses related to payment cards. Furthermore, you can find there original reports right from domestic market, profiles of regions, companies and personalities from the world of payment cards. The European Payments Council (EPC), representing payment service providers, supports and promotes European payments integration and development, notably the Single Euro Payments Area (SEPA). The EPC is committed to contribute to safe, reliable, efficient, convenient, economically balanced and sustainable payments, which meet the needs of payment service users and support the goals of competitiveness and innovation in an integrated European economy. It pursues this purpose through the development and management of pan-European payment schemes and the formulation of positions and proposals on European payment issues in constant dialogue with other stakeholders and regulators at the European level and taking a strategic and holistic perspective. The primary task of the EPC is to manage the SEPA Credit Transfer and SEPA Direct Debit Schemes in close dialogue with all stakeholders. The EPC is an international not-for-profit association which makes all of its deliverables available to download free of charge on the EPC Website. For further information please contact secretariat@epc-cep.eu or visit www.epc-cep.eu. Payments Cards & Mobile has twenty years experience reporting on card payments, POS Terminals, Issuing and Acquiring and Risk & Compliance plus the cutting edge technology of M-Payments, Contactless Payments, M-POS and M-Commerce. It is published six times a year, with supplements, and has worldwide distribution.